Mystery. It’s one of the best things about genealogy, and also, paradoxically, one of the most frustrating. I was confronted with several mysteries when I set out to learn as much as I could about the MacVay family 22 years ago. Since then I’ve been able to solve many of them. I figured out where my family had come from. I found relatives. I dug up information on when and where people had been born, where they had ended up, and when they had died. Eventually I broadened the scope of my research to include the MacLeods and other families in my tree. New mysteries presented themselves. I combed through records, followed leads, contacted people, put clues together, came up with theories. One by one, the mysteries were solved. I think I’ve done pretty well. There are still a number of mysteries I need to solve, some of which have baffled me for years. But all these years there was one mystery that really frustrated me. For 22 years, I wondered just what had happened to my great uncle Kirk. Kirk and his brother Sandy were the only two of William and Fanny MacVay’s six children not buried in Cape Breton. Sandy wasn’t a mystery for long, because his daughter showed up at my dad’s place in a motor home one day in 1990 and filled us in on where he’d ended up (Sandy died in Seattle in 1952). That left just one mystery: what happened to Kirk? My father (whose middle name is Kirk) didn’t know much about his uncle. Over the years I managed to dig up bits and pieces of information, but I still didn’t know exactly when, where or how Kirk had died. No one knew. But I never stopped digging. In 1897, my great-grandparents William and Fanny MacVay lived in Little Ridge, just outside Saint Stephen, Charlotte County, New Brunswick. They lived on the farm William had inherited from his father, Alexander MacVay, who had died the previous year. William and Fanny had four children – Robbie, Sandy, Maud and Armour – and were about to welcome their fifth child into the world. William Kirk MacVay was born on March 6, 1897, just across the border in Grand Lake Stream, Maine, where his mother’s family had settled years before. It’s fairly obvious where his first name came from. His middle name – the name he would be called by for the rest of his life – probably came from the fact that Fanny’s brother Frank Macartney had married Mabel Kirk the previous year. Kirk spent his very early childhood in Little Ridge and, like his older siblings, also spent quite a bit of time across the border in Grand Lake Stream. The border wasn’t what it is today; the MacVays crossed the border like we cross the street. I know little about his early life in Little Ridge except that he and his siblings basically lived in both countries. I also know they had a bit of excitement in 1898 when the MacVays’ house burned down – Kirk’s first experience with a devastating fire and, sadly, not his last. When Kirk was four years old, he and his family moved to Sydney, Nova Scotia, where his father and older brothers had secured jobs at a newly-built steel mill. After a short stay on Falmouth Street, William built a big house on George Street and William, Robbie and Sandy settled into a routine: they would put on their best suits in the morning, walk to the steel plant, change into coveralls, lay bricks all day, then clean themselves up, put their best suits back on, and walk home. 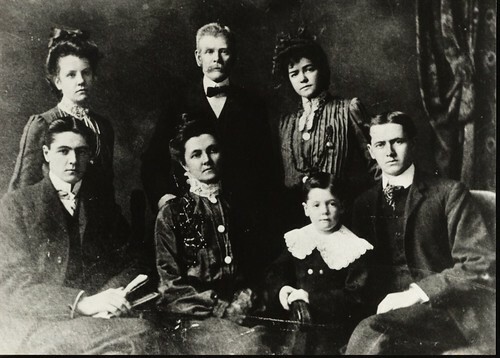 The MacVays in 1904. Back row, left to right: Armour, William, Maud; front row: Robbie, Fanny, Kirk, Sandy. Kirk was about seven years old in this picture. Kirk, meanwhile, enjoyed a carefree childhood. An elderly relative once told me that Kirk had been a cheeky little boy who kept his staunchly conservative father busy. His father was proud of his Scottish heritage and, I’m told, played the bagpipes and even did some Highland dancing. However, he reserved such displays for the appropriate time and place, and was apparently horrified when he found out young Kirk was doing the Highland fling on street corners. Other than that, I know very little about Kirk’s growing-up years in Cape Breton. He appears on the 1911 census, and then in 1914 in McAlpine’s Sydney City Directory, which says he lived with his parents and worked as a clerk. Then he disappeared. Well, he disappeared for me, anyway. For years I couldn’t find any trace of Kirk beyond that 1914 directory listing. (I later found him on a 1916 census of the prairie provinces, lodging with a family in Maple Creek, Saskatchewan.) Older relatives said he’d died in an explosion or fire in the United States in the late 1920s or early 1930s. But I couldn’t nail down the details. Someone said he’d been killed in an explosion while doing welding work on a big oil tank. Or maybe a ship. Or maybe he’d been killed in a hotel fire in Chicago. Or a mine explosion in Pennsylvania. The relative who told me about Kirk’s dancing on street corners said she remembered Fanny’s despair upon finding out her son had died. But she couldn’t remember when, or where, and for years I could find no trace of him. Kirk’s whereabouts remained a mystery for several years, until I found his name in a record of a border crossing made by his younger brother Frank, my grandfather. Eighteen-year-old Frank crossed the Canada-US border at Vanceboro, Maine on 1 March 1927. He said he was going to the US to look for work. His contact in the US was his brother William K, who lived at 18 Charles Street in Malden, Massachusetts. He had probably gone to Malden because of his mother’s family, the Macartneys, who lived there and in nearby Lawrence and Lowell. So I knew Kirk had lived in Malden in March, 1927, and that he had probably died before the census was done in 1930. But that was all I knew. I still couldn’t find him. Then, just last week, I found him. Or rather I lost him, for as the details of his death emerged, I felt like I was watching it all happen before my eyes. Actually, I was reading about it in the newspaper, since most of what I know about Kirk’s tragic death has been pieced together from old newspaper archives I found online. And so the events leading up to Kirk’s death unfolded before me as if I was reading them in this week’s papers. In 1928 Kirk was still living in Massachusetts. Like his older brothers, who had both moved to the US for work, Kirk was able to live and work there easily due to the ambiguity of his place of birth. He was, for all intents and purposes, American. The papers gave his address as 28 Faulkner Avenue, Tewksbury. Faulkner Avenue is actually in neighbouring Wilmington, not Tewksbury. Also, there’s a Faulkner Street in Malden, not far from Charles Street. I don’t know exactly where he lived, but I do know where he worked. In 1928 he was working as an electrician at the Beacon Oil Company’s sprawling 50-acre plant and refinery on the banks of the Mystic River in Everett, Massachusetts, not far from Malden. On 10 February 1928, he was doing some electrical work on the roof of the pump house when a massive explosion occurred. The blast was felt and heard all over the Boston area, where windows shattered and dishes fell off shelves. A monstrous black cloud climbed up into the air, joined by flames that reached 200 feet high. Kirk survived the explosion but found himself trapped on the roof of the pump house. The only way out was through the fire. Faced with the choice of being swallowed by the black wall of smoke or trying to escape, he chose the latter and jumped right through the flames. A photo of the fire by Leslie Jones of the Boston Herald-Traveler newspaper. “Workmen, with their clothing ablaze, ran like living torches from the fiery ruins,” wrote one reporter. Kirk must have been one of them. According to the same reporter, some of them were dead by the time the first firemen arrived on the scene. This photo by Leslie Jones of the Boston Herald-Traveler newspaper shows firemen removing charred bodies from the scene of the fire. McVAY William-28 Faulkner Av Tewksbury – Severe burns about body, face and extremities – Danger list. 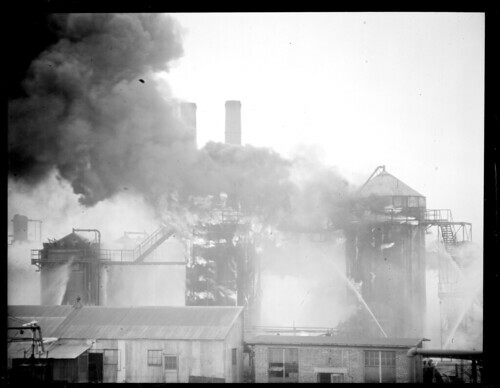 “In 1928, when I was a fourth-year medical student at Harvard Medical School, there was a fire at the Beacon Oil Company in Everett, and 31 men were burned. But, Cope said, the treatment involved painstaking – and painful – cleaning of the wound and turning of the patient’s body to get at the burns. Cope would later argue that oil should be used instead of tannic acid, because “most burns sterilize the wound as they happen and…doctors should simply cover them and let the blister provide a natural protection. That way, fewer doctors could treat more patients.” This was an important thing to consider, especially after Pearl Harbor, where Cope said “the medical people were overwhelmed by the casualties”. BOSTON, Feb 21 – By Associated Press – The death toll from the explosion and fire in the plant of the Beacon Oil Company on February 10 was increased to 14 today when William Kirk MacVey of Tewksbury died at the Massachusetts General hospital from the effect of burns received during the fire. MacVey was an electrician and at the time of the explosion was working on the pumphouse. He jumped through the flames. Finally finding out the truth about Kirk left me with mixed feelings. I was happy, of course, to have solved such a longstanding mystery. But I was also a little sad. Maybe it’s weird to feel that way about someone who died 84 years ago, but I did feel a little sad. Maybe it’s because I always assumed he’d died instantly, and was surprised and a little horrified to find out he’d held on for almost two weeks like that. And he was so young, just shy of his 31st birthday. Or maybe it was because I’d been wondering about Kirk for so many years, thinking about him. I’ve come to know that generation, people who died years before I was born, almost like I know my own aunts and uncles. I don’t know. But yeah, I felt a little sad. I thought maybe I was sad because that mystery was solved now, that chapter closed. Like how mountain climbers finally reach that elusive peak and ask ‘What now?’ But no, I guess that’s not it. After all, I have many more mysteries to solve. In fact, one of those mysteries does involve Kirk: Did he have a wife and children? My aunt said she thought he had. Someone I found on the 1930 census may have been his wife and two children, but I’m not sure yet. I’ll keep digging. While I’m not sure whether Kirk was married or had any children, I did find out something interesting about the aftermath of the Beacon Oil disaster. The wives and children of those killed in the disaster got some insurance money, but it was still hard for widows left with large families, including some very young children who would never really know their fathers. The mayor of Everett, James Roche, had worked at the Beacon Oil plant and knew some of the victims, and wanted to help. So he brought in some big-name help. Mayor Roche of Everett was also the manager of the refinery at the time. He felt a responsibility to the widows and orphans left behind after the explosion and wanted to hold a charity ball game to raise money for them. He also had a buddy down at Fenway Park by the name of Bill Carrigan, who happened to be the Red Sox manager. Carrigan had also played for the Sox with Babe Ruth early in both their careers: Ruth pitched, Carrigan played catcher —the battery, I think it’s called. As the story goes, Carrigan was onside immediately. He volunteered 16 rookies and put a call in to his buddy Miller Huggins, manager of the Yankees, the team Ruth played for. He also offered Fenway Park as a venue, but Roche wanted to hold the game in Glendale Park, in Everett, as it was close to where most of the families lived. When Huggins let Ruth know about the game, he volunteered right away. So did Lou Gehrig, and Tony Lazzari, who ended up injured from a previous game and sat in the bleachers to watch. Also, several other players offered to sit in the stands and cheer the game on. Carrigan and Huggins set the game for Thursday, August 9, 1928, almost 6 months to the day after the accident. The Yankees were coming to Boston that week and playing 4 games at Fenway. The plan was to wind up the game at Fenway in the afternoon (major league games were played in the afternoons in those days due to lighting), and bus both teams up to Glendale. Ruth, Gehrig and Carrigan played for the Everett team (The Knights of Columbus Blues) against 16 Boston Red Sox rookies. 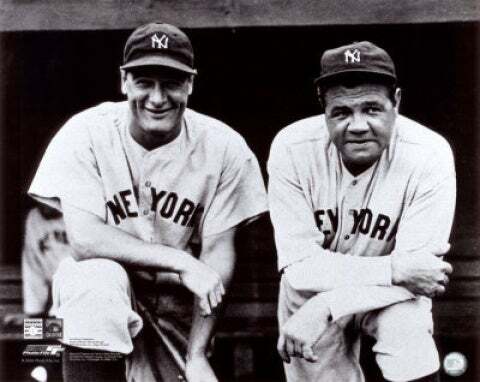 New York Yankees superstars Lou Gehrig and Babe Ruth. My grandmother got $1,000 and used it to buy a farm on Prince Edward Island where she was from and where she moved her family to after my grandfather died. My own father credits that ball game and Babe Ruth and Lou Gehrig for helping his mother keep them together. He said without the money from the ball game they might have ended up separated among relatives, which was common in those days, or sent off to an orphanage. Despite my odd sense of loss over Kirk’s death, it’s somewhat comforting to know that if he did indeed have a wife and kids, they probably got a little boost from the help provided by Gehrig, Ruth and the others. I don’t know, of course. There’s so much I don’t know. No matter how much I uncover about my family, there’s always so much I don’t know about their personalities, their voices, their secrets, their hopes and dreams. I have to accept that what I’ll never know is a vast ocean compared to what I can uncover. But I’ll keep digging. Because I love a good mystery.